Last edited by ptuomov; 11-05-2017 at 09:32 PM. I think Greg Brown is making an intake manifold lik that last one but welded as it is cheaper to make them at low volume than a cast. Too bad someone doesn't make one out of plastic. Only the crude prototype that was tested on Rob and Jim's engine was welded aluminum, which left quite a bit on the table. The laminar ait flow, through smooth aluminum, was a huge problem for this prototype. The prototype manifold flat "ran out of airflow" on Rob's engine. The "production" version (soon) will be very different. Impressive how on the 5.0 the intake starts taking off at 4,000 RPM, perfect power production for a track car. Out of curiosity, what do you mean by laminar air flow being a problem? Getting a long-runner intake manifold designed for a confined space exactly right the first time would require a lot of luck. I thought the prototype intake worked pretty well on the 6.5L motor, based on the posted evidence. According to my naivety on the topic, and looking at both torque peaks which represents the engine's VE sweet spot, the manifold as-is seems a good compromise between the two engine sizes. Using a target torque-peak of 4500 RPM which represents a typical engine-speed exiting a corner on the track, the 5.0 would benefit from a slight reduction in runner cross-sectional area to move its torque peak down a bit in the power band. Likewise, the 6.5 could use a little extra area to move the torque peak up a little higher, maybe even up to 5k for the sake of all things called a gearbox and drive train. With all that said, I would definitely run the intake as tested on my 5.0. No doubt an impressive first stab at an intake. Out of curiosity, what do you mean by laminar air flow being a problem?<br /><br />Getting a long-runner intake manifold designed for a confined space exactly right the first time would require a lot of luck. I thought the prototype intake worked pretty well on the 6.5L motor, based on the posted evidence. I think we've wandered away from Catorce's intake/thread far enough, without getting into a long winded discussion about airflow. I'm guessing that there are volumes of information, on the Internet, about airflow on various surface finishes. Forty five years of testing and experimenting on my own flow bench has taught me these tough lessons, first hand. I've seen 10 or even 15 percent increases in airflow wiped out from simple changes in surface finish. This is a huge, mostly overlooked, issue when dealing with airflow through cylinder heads and intake systems....and the results vary if one is dealing with pure air or air mixed with fuel....making things even tougher to calculate. Catorce brought up the idea that there were no other intakes for the 928 application. Suffice it to say, there are other intake designs, for both the smaller and larger engines, that are past the initial prototypes and initial testing. I'm personally looking forward to the fitment and testing of Catorce's Tunnel Ram prototype. The short straight smooth runners of a fabricated tunnel ram intake work well on a drag race engine, where fuel is mixed with the air above these runners. Laminar airflow through the smooth runner surfaces increases the overall turbulance and improves fuel atomization, which is why fabricated tunnel rams generally perform better than their cast akuminum counterparts. How the 180 degree change in airflow direction, just before the these runners, affects airflow in this particular application, is something I have zero data on. Regardless of how Catorce's prototype intake performs and if it turns out to be applicable to a road race engine, it is an impressive effort which needs to be applauded, in this tiny 928 market/world! Last edited by GregBBRD; 11-06-2017 at 01:12 PM. 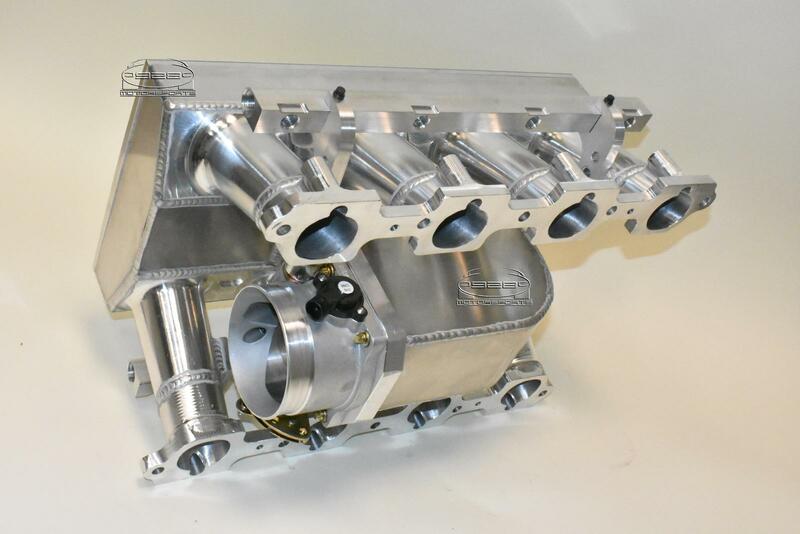 Here are a couple new pics of our finished "654" manifold, this time with the cover on it and the throttle body mounted. Next week we will be mounting it onto Adam's engine and preparing it to go to the engine dyno to see how it performs. Remember: earlier in this thread we have engine dyno results of this very engine with the stock 5.0L manifold and a modified extrude-honed manifold on it. 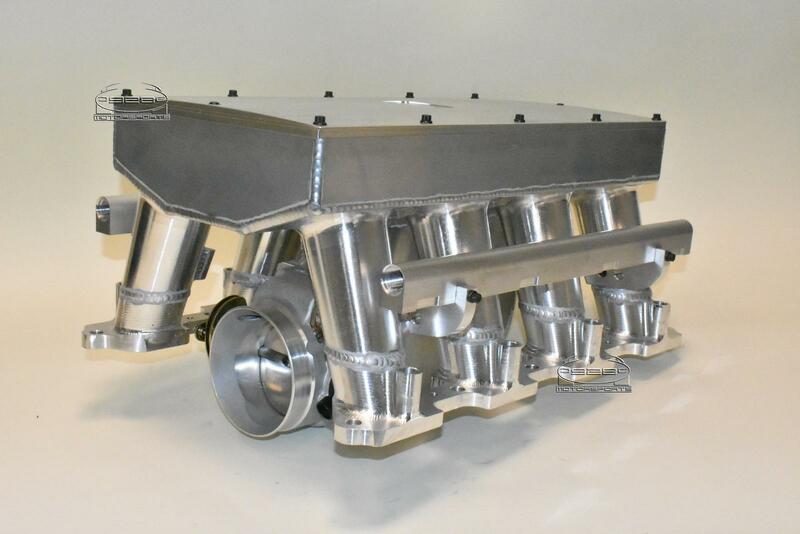 There have been no other changes to the motor, so the results we will get from this manifold will be able to be compared directly to those earlier dyno's for a very nice before-and-after review. Carl, thanks for the update. Sorry for all the previous chatter, but this is such an exciting development within the 928 community. Damn that is a beautiful piece of kit!! Popping the hood and seeing that impressive piece of jewelry on top of a 32 valve is just pure 928 ****. Thanks for the pics Carl. The rest of the motor Carl built looks amazing too. I have no illusions about actively flogging and campaigning this car week after week. Mostly, it will be a static display interspersed with some racing. Too nice and rare a car to damage IMHO. Let me explain. A couple weeks ago I took a class at Steve Hogue's; it was a 2 day metal working class. For those that don't know Steve, he is one of the world's premier Porsche restorers. He does 911Rs, RS61s, 550s, etc. The average car he works on seems to be worth 1-2 million. These are ultra rare race and street cars. One thing I noticed is that he was working on many cars of which there was just one in existence. In some cases, just one ever made. Don't get me wrong, the Devore car is 1 of 1 but isn't an RS61 or worth significant money. That class made me take a second look at it in a new light, however. I really love the car, and it has had a history of bad stewards who have let it go to ****. On the one hand, I want to drive the **** out of it, and I will, but my focus is more shifted towards gentleman racing than trying to win current race series. I would like to do Rennsport Reunion, vintage racing, that kind of stuff. Races where fellow drivers respect the other cars and are not going for contact. There are exactly three (3) sets of kevlar fenders on the planet for this car, and the Devore car wears one of them. Much of the stuff Bob did was irreplaceable, and the car as a whole is pretty legendary. I don't want to damage it. I've spent 75K on the build so far, and I am nowhere near done. That is OK. I have plenty of 100K builds in the stables. But NONE of them are a 1 of 1. None of them are essentially irreplaceable. The Devore car will drive, and it will drive a lot. I am still making it competitive from a race standpoint. It is just the WAY I am intending to drive it will be a little different. If I want to go 10/10ths I will go buy a cup car that I can throw away when it gets old. But I don't want to lose the Devore car to overt wear and tear or collision because I was jockeying for a spot. This mentality is pretty much espoused by everyone who owns a historic race car of which only one exists. I don't blame you a bit. Too much history (at least in the 928 world) to destroy it. I can't wait till we get to see/hear it run and maybe do a few laps.